Our warmest sleeping bags, yet still extremely light. Feature waterproof Pertex Quantum Pro (Formerly Endurance) fabric for use in extreme conditions. In our Expedition range of sleeping bags, we make use of two fabrics to create a shell which is durable, windproof and comfortable. Pertex Quantum Pro (Formerly Pertex Endurance) fabric is used on the outer shell and parts of the inner shell. 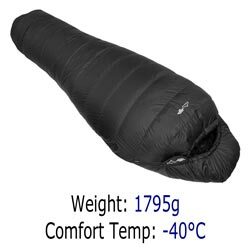 Quantum Pro is fabric is waterproof, windproof and provides durability and ruggedness for the most extreme conditions on Earth (please note that sleeping bag’s seams are not taped so the bag itself is not waterproof). In high abrasion areas of the inner bag, the hood and footbox we use Quantum Pro, in the body area of the bag we use Pertex Quantum 53g/m² (formerly Pertex Microlight) this provides a soft feel and comfort. Swipe the table to the left and right to move the columns, the first column if fixed. The filling is white, Polish, ‘diamond grade’ super goose down, whose Fill Power rating equals 870 cu in. 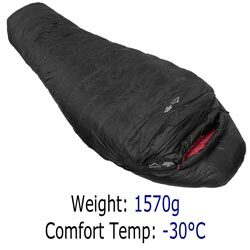 Fill Volume is a measure of the total insulating power of the sleeping bag. The main part of the inner is made from crimson Pertex Quantum 53g/m² ripstop fabric (formerly called Pertex Microlight), but critical areas (ones that may get wet in extreme conditions or areas of abrasion) are made from the same Quantum Pro fabric as the outer. These include the hood inner, and the footbox.